Freaky Knitter, knitting without fear! : Inspiration! I had the most wonderful day, beginning with some much needed house cleaning. I worked on my sock pattern; which I am 99.9% sure is ready for public consumption. Then my glorious friend Sandy came over and we went over to Allison's for a wonderful afternoon of snacks, spinning, and knitting! Absolutely GLORIOUS!! I just love going to Allie's house and hanging out. It is like a wonderful, warm safe haven in life's craziness! I'll come over anytime Allie, just say when...Amy was there too and it was so nice to get to know her better. 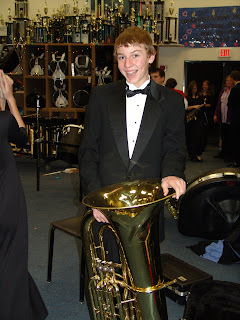 Now, I do need to insert a little sideline about my Tuba playing young man! On Tuesday night we got to see the award winning McQueen High School Band play for us in all their finery. We got a tuxedo for Chris and he looked so handsome, I was overwhelmed. He is not my little boy anymore...sniff, sniff. What a handsome guy! He is only missing that one small accessory...the hot pink Colinette wrap he so desperately wants! !